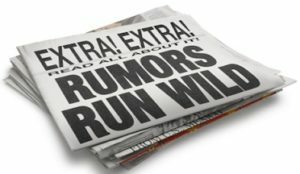 How the rumor mill works, and how to manage it - darbyDarnit! Several years ago, a student carrying a rifle and wearing a Fred Flinstone mask at St. John’s University in Queens was subdued by another student and a security officer. The school immediately went on lockdown and text messages were sent to students’ cell phones. Apparently, the text message went out while the struggle was still underway, because the student helping to hold down the gunman felt his phone vibrate during the incident. There were no hostages. There were no other gunmen or suspects. And, it doesn’t appear as though anyone was actually masquerading around in presidential masks. In a crisis situation, rumors are inevitable, but do not have to spiral out of control or go unchecked. 2. when faced with a situation that is both ambiguous and important, people retell related rumors to create meaning. Here is another scenario from actual events showcasing those principles in action. On September 11, 2001, I was working in downtown Houston and I received several frantic calls from family who said that they had heard Houston refineries, chemical plants, and oil company headquarters were targets and they urged me to leave work. Today, we know that Houston was not a target, but two big cities had been hit, there was not a clear understanding of the situation, and someone close to them was working in a major metropolitan area that has strong international presences in middle eastern countries, typically recognized as the breeding grounds for terrorists. So it is not surprising that such a rumor would be given credence, or even be built up, by those near and dear to me. The rumor mill is a fast moving channel and a force to be reckoned with, whether at a university, among friends, or in the workplace. The reality is that it can be a damaging influence and it can be a helpful resource. In an environment of high change, which by definition is also an environment of high anxiety, where there is not enough information to generate a complete and accurate sense of context, people will fill in the blanks with whatever information fits their personal and social needs, interests, and contextual perspectives. Often, the blanks in the information pool will be filled with content reflective of the worst case scenario and/or that makes for a more salacious story. If there is either no ambiguity or no importance, then a rumor will not continue. If you can reduce one or both at all, the power of the rumor will be significantly diminished. Doorley and Garcia also indicate that speed in addressing rumors is key to shortening their lifespan and their tempering their impact. Additionally, the rumor mill is a lot less powerful in organizations that are transparent and proactive in their communications, those where front-line supervisors are informed – because employees trust those closest to them in an organization – and those that create two-way dialogue and feedback channels. During a crisis or in a high-change environment, employees need much more regular information and more personal, face-to-face communications. I’ve seen companies manage the rumor mill well, and I’ve seen executives discount the influence and validity of the grapevine, to their detriment. I’d like to hear about some of the best and worst scenarios you have seen on the rumor mill front. Do you have an experience to share?